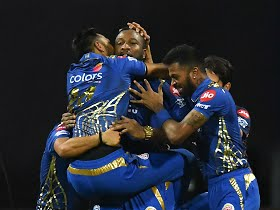 Enter Blog Content here.Kieron Pollard struck a brilliant 83 from merely 31 balls as Mumbai came from nowhere to stun Punjab in a chase of 198. Pollard was also stand-in captain and led from the front to power Mumbai home at the Wankhede. Earlier, KL Rahul's fine hundred and a 36-ball 63 from Chris Gayle took Punjab to an impressive 197 for 4. After the dismissal of Chris Gayle, Punjab lost few wickets in a heap even as Rahul was constant at one end. This probably hurt them in the end. “We finished on the right end of the result and thanks to God for that too. Obviously, Rohit is the captain of the team and it was only a precautionary measure for the team. He should be back in the next game. I would gladly give it back to him and field at the boundary, while also thinking of what to contribute to the team,” he added.